The New Zealand Indices of Multiple Deprivation: a new suite of indicators for social and health research in Aotearoa, New Zealand is a 2017 article in the PLoS ONE journal about the development of the NZIMD and NZ data zones. Towards a new Index of Multiple Area‐Level Deprivation for Auckland, New Zealand is a 2016 article in the New Zealand Geographer about a pilot study for Auckland that explored explore the feasibility of developing measures of area deprivation from routinely collected administrative data. 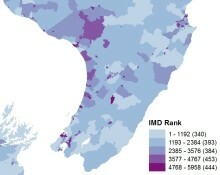 The pilot study index was called the Auckland Index of Multiple Area Level Deprivation (IMALD). Developing intermediate zones for analysing the social geography of Auckland, New Zealand is a 2016 article describing the creation of two new geographical boundary files, known respectively as lower zones and upper zones, for investigating social phenomena and visualising disparities in health outcomes in the Auckland Region of New Zealand.